The first COD on Battle.net has found more players than COD: WW2. Call of Duty: Black Ops 4's launch day digital sales on PC have more than doubled over last year's Call of Duty: World War 2. Publisher Activision describes the sales as a "new franchise high". This is the first Call of Duty game to be released on Battle.net rather than Steam, which had previously been the series' home for a long time. You'll probably recall that this is the first Call of Duty not to launch with a five-to-seven-hour campaign mostly composed of shooting lads in corridors, too, instead packing a battle royale-esque Blackout mode that was the subject of a high-profile beta on PC. Maybe that element is more of a draw to PC players this time around. Personally, I enjoyed the almost fast food style of Call of Duty campaigns, but given that I haven't finished one since Modern Warfare 3 in 2011, who am I to complain? As thrilling as sales numbers are, the most important thing about Black Ops 4 on PC is obviously what we think of it. 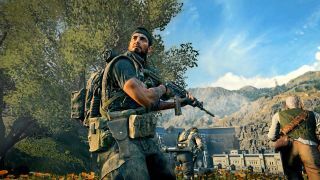 "With Black Ops 4, Treyarch is giving us exactly what they think the legion of fans want," says Steven T. Wright in our review-in-progress. "Though that’s not quite as refreshing as a truly innovative game, that’s not what I come to Call of Duty for. It’s exactly what it says on the box, and sometimes, that’s good enough." We'll have a full review later this week. Activision's sales talk can be found here.